A little while ago I shared the before photos of my under stair cupboard and told you about my plans to turn it into an office, albeit the world’s smallest office. Well now it’s finished, I have the after photos for you. My camera lens isn’t wide enough to get it all in so I used my phone, hence the quality being a bit rubbish. We got the desk from Argos, it’s quite narrow so leaves enough room for the chair which is from Ikea, as are the storage boxes and wrapping paper holder (carrier bag holder!). We don’t have an electricity socket in there so we plugged some fairy lights into a plug in the living room and Mr C put them all across the ceiling. 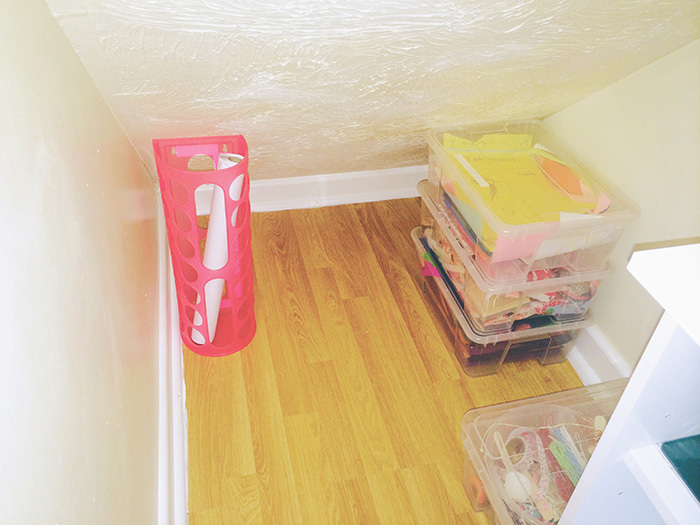 It’s not the best of spaces due to it being so small but it’s nice to have somewhere to put all my craft supplies. What it’s really missing is a sky light window, with a VELUX insect screen (we have a wasp nest outside our house! ), the lack of daylight means it feels a bit cave-like. Have you ever thought about doing anything with the cupboard under your stairs?